Osteoarthritis tips and exercises: Get out, be active, feel better!!! Did you know that 50 million Americans suffer from osteoarthritis (OA)? You may think that OA only affects the elderly. And that’s true; it does, but I bet you didn’t realize that 2/3 of people with arthritis are under the age of 65 (CDC). So maybe you’re tired of that nagging and aching pain in your joints–most people are, especially with the long, cold frigid winter we’ve had. Check out these options that you could consider in order to decrease your pain and increase your activity level. Not sure if you have osteoarthritis? Watch for these symptoms: sore and/or stiff joints, pain, decreased range of motion and subsequent functioning. These symptoms are commonly felt in weight-bearing joints of the body including the hips, knees, and low back, but you may also experience pain–usually to a lesser degree–in your neck, fingers, thumbs, and ankles. Sound familiar? Start taking care of that. To date, there is no absolute cure for OA. Typical treatment includes medication for pain relief and therapy (physical and occupational therapy). Research continues to support an ACTIVE LIFESTYLE and LIGHT AEROBIC/RESISTANCE EXERCISE AND CONDITIONING as one of the best ways to combat pain and improve function. Here are a few suggestions, but you should talk with your rheumatologist or your primary physician before you engage in any exercise routines. Walking at a moderate pace, one where you still can carry on a conversation, is beneficial for your joints as well as your heart, and you could always give Prancercize a shot. Research continues to support the benefits of exercising in the water for people with arthritis. When you step into the water, the pressure of the fluid helps to relieve some pain around your joints, and also takes away some of the pressure of gravity making it less painful to move. If you’d like to swim but don’t know how, check with your local pools or health clubs with pools. Usually, they will have coach who offers affordable, private lessons. Walking in the water can even be a good alternative! And let’s not forget the importance of a strong body. 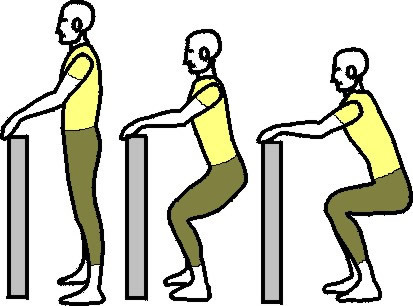 These three exercises are just a starting point, but they will help to give you the stability you need. And in case you didn’t know, increased muscle strength helps to preserve the joint, limit damage and inflammation, and protect soft tissue structures, so the stronger you are, the less pain you’ll experience. For many people, though, exercise isn’t enough, and they would benefit from the professional help of a physical/occupational therapist. Physical Therapy for osteoarthritis utilizes a variety of treatment interventions and exercises, designed to improve range of motion of your affected joints and increase your strength to perform activities of daily living with decreased pain. 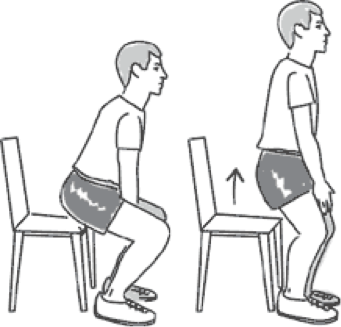 These exercises are commonly performed in non weight-bearing positions to decrease the amount of stress on your joints while optimizing muscle strength and joint motion without causing harm or pain to you or your joints. Now, some people claim that not much can be done for OA pain, and therapy is not a good alternative. Fortunately, they couldn’t be more wrong! The US Department of Health and Human Services has very good research and evidence demonstrating that exercise through PT and OT services, light resistance training, and aerobic conditioning can help increase your function and decrease your pain. So you’ve got some options. Talk to your doctor about what is best for you. You can also talk to us! Ask me questions in the comments or give us a call at 815-398-9491.